We use top-notch printing & coverstock. Quality is communicated in a blink of an eye, so it’s important to use the best printing services and quality materials. Think about a time when you have received a flimsy business card or a limp handshake. On a psychological level, this communicated weakness about the person or business. People psychologically transfer that feeling of quality from a postcard’s make and design to the quality of your dental practice and services. 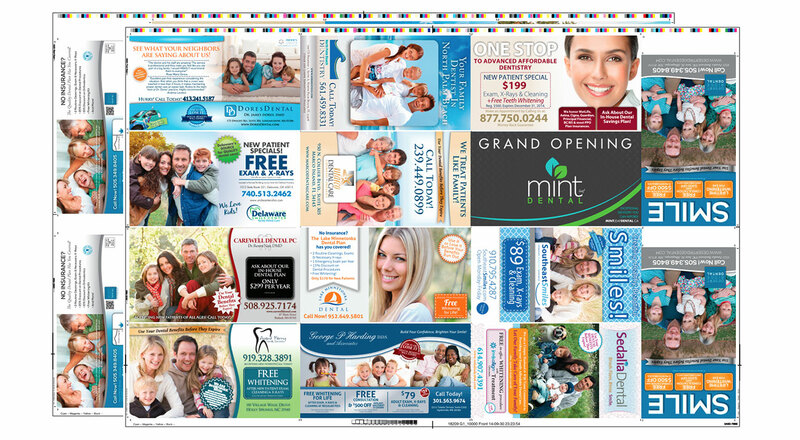 DentalMarketing.net provides dental postcard marketing with printing quality that will guarantee you make the best first impression! Using high-end, 8-color Hiedelburg presses, your postcard is printed with careful attention to detail on a 100 pound gloss cover stock paper, making it stick out in a prospective patient’s mailbox. The postcards are full color on both sides, with an attractive gloss coating. Other dental marketing companies would have you believe that these details aren’t important, but you know better. The postcards that you mail are the first thing that prospective patients will see about your practice. What message do you want your postcards to send? Obviously, you want them to say that your practice is in a class apart. We understand that, and we promise you will never receive anything but the highest quality from DentalMarketing.net. We pride ourselves on offering the highest quality and most uniquely designed dental postcard marketing out there. Visit our custom postcard gallery to view some of our sample postcard designs and if you’d like to request a sample of our cards, please fill out the form below.